Here at Backwoods we love finding great products from local companies. Not that there is anything wrong with going out and buying the best product available from a larger retailer, but you get that added sense of stoke when you buy something from a company that is in your own backyard and supporting those people you share the trails with. Klymit gets you the best of both worlds. The Static V sleeping pad offers one of the best solutions for your outdoor comfort while staying in budget and supporting a great company. 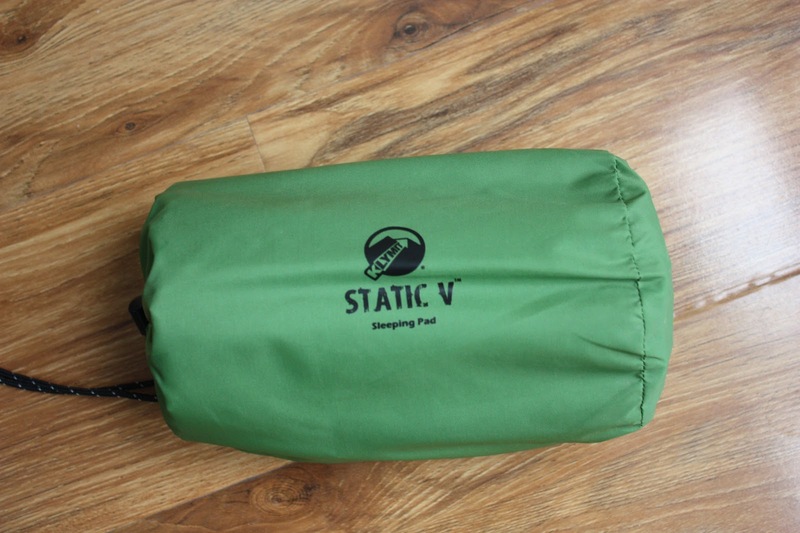 I have slept on a variety of sleeping pads and I must say, the Static V has a one-up on all others that I’ve tried. I think the best feature about this products is the cost. The Static V retails at $59.95 which is about half the price as most other comparable pads on the market. It also comes with a carry-sack and patch kit. You won’t get that with some of the other pads out there. Getting the Static V made me stoked right from the get-go because I was already saving money to use on other gear. The pack size of this pad is perfect too. Coming in at just 5″ x 9″ this thing will fit in just about any pocket on your pack. It weighs just over 18 ounces so you don’t have to worry about sacrificing comfort on the trail for comfort at camp. A small pack size is great but I can’t stand a short pad. The Static V is a whopping 72″ long and 23″ wide. It’s perfect for me since I am 5’11”. I don’t have to hang my feet off the end or build a pillow for my head off the other end. The v-design in the pad creates the need for fewer breaths to inflate than other pads. This is nice, especially at high elevations where blowing up a pad can cause dizziness. Klymit has designed a great valve for their pads too. Rather than trying to screw the valve shut while blowing air into your pad, you simply push down on the valve and it closes. Give it a quarter turn to lock it in place. After inflation the pad is 2.5″ thick. Like most other pads, you don’t even come in contact with the ground when laying down, even on your side. The Static V is an ideal pad if you are a side-sleeper like me. Klymit also offers other ultra-light solutions which would be great for back-sleepers. I am really happy with my purchase of the Klymit pad. I have recently moved to China where I’ll be spending the next year and made sure that the Klymit Static V was in my pack. This will be a valuable piece of travel gear as even sleeping in a hotel bed can be just as bad as sleeping on the ground.